The food in Turkey is incredible—beyond compare, I must admit. It was one of the things I was most excited to get back to. I get a Turkish meal every day at school, and tonight our bartender at the social center fixed us all a delectable meal of grilled fish, four delicious Turkish salads, flat bread, and a dessert. All that for only 12 Turkish Lira (about $7). Incredible! (Actually, I was disappointed to see that the fish was served whole, but once I took a bite, I could have cared less. It was çok lezzetliı (delicious). One thing that always amazes me, though, is the convenience of the fast foods these people put out. 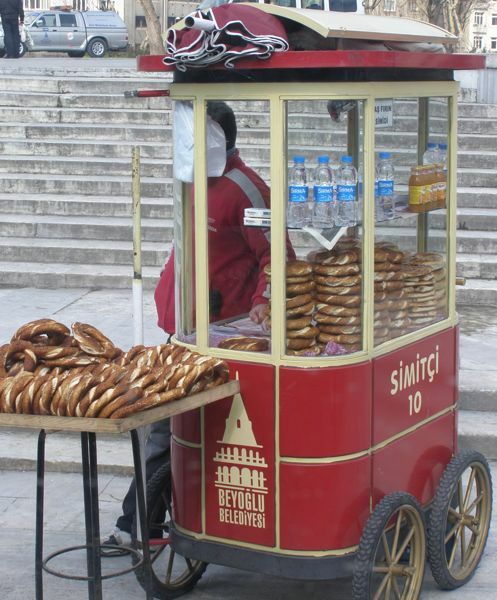 You can always pick up a bite on the road, at least a simit—a large bagel-like bread coated with sesame seeds, sold all day long from glass-encased street vendor wagons. 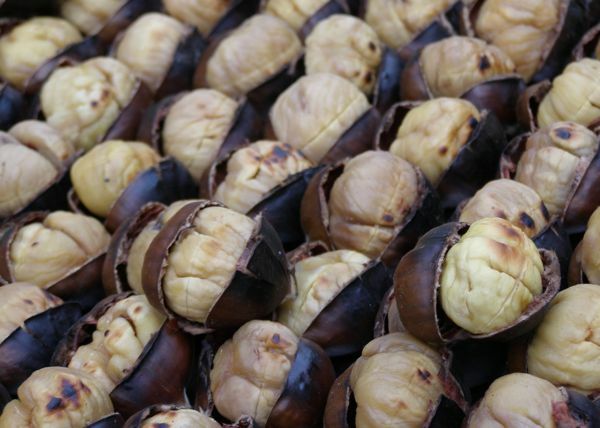 The other two things you can often pick up along the way are rice-stuffed mussels and roasted chestnuts. I don’t actually like either of them, but they’re certainly popular fare here. 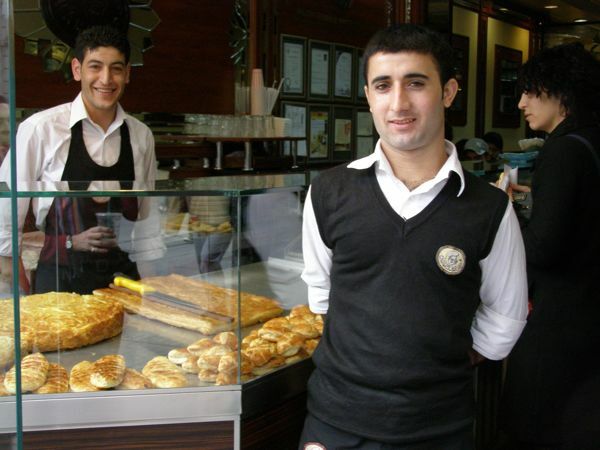 The Turks are masters of fast food. The two things I’ve often succumbed to are börek and döner. Börek is a pastry made with thin layers of filo-like pastry (yufka), often layered with cheese, spinach, or other delectable treats. They slice it from huge pans in a flash, then cut it into bite-sized pieces, bim-bam thank-you-ma’am. Brushed liberally with olive oil, it carries the rich flavor of that delectable fat. 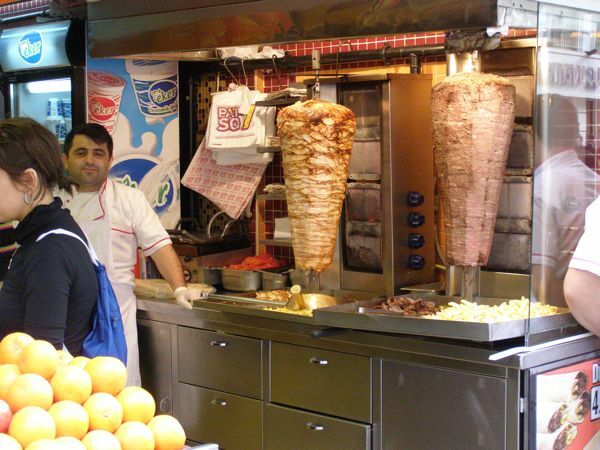 Döner is a favorite of nearly everyone. It’s sliced from a huge conglomeration of meat (usually lamb or chicken) that’s spiced and stacked on a vertical skewer. We’re talking a LARGE skewer, anywhere from 3 feet to 6 feet high. The meat turns around and around next to a vertical heat source, and the chef cuts thin slices from it as the meat cooks. It’s usually piled into a small French loaf or a piece of pita bread, complete with tomatoes, peppers, and onions. YUM! You can get a half-loaf döner for less than a few lira (about a dollar). Lots of people are familiar with Greek gyro sandwiches—well, döner is nearly the same thing, but without the yogurt sauce. In fact, sometimes they put French fries in the sandwich as well, which DOESN’T appeal to me in the least. Sort of like a mashed potato sandwich. Starch! Unfortunately, McDonald’s and Burger King have caught on here as well. McDonald’s has come up with a McTurko, which must be a lamb-wich, but I don’t know. I refuse to patronize them over here. It seems a bit sacrilegious somehow. The famous McDonald’s McTurko—What? Never heard of it? 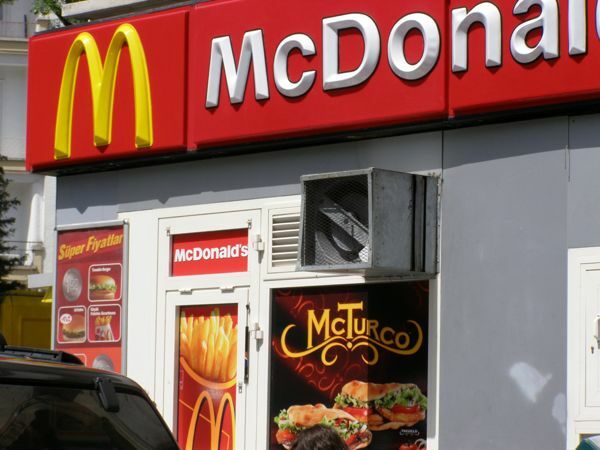 One interesting thing about the Istanbul McDonald’s, though, is that they deliver. Yup. 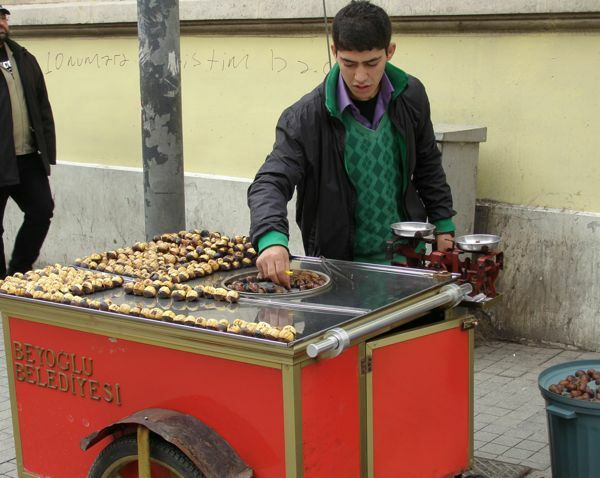 Every fast-food restaurant, Western or Turkish, has motorcycles with little delivery boxes on the back. Last year at Robert College I had Turkish meals delivered to me numerous times—they’ll even deliver an inexpensive meal for one person. Turkish hospitality, I guess. No one should starve in Turkey, let me tell you!